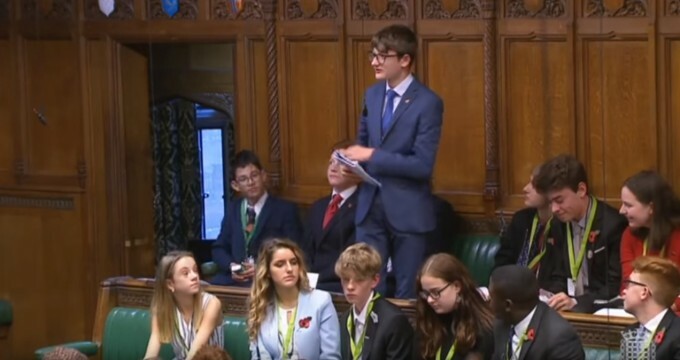 Falmouth College student Will Daniell spoke at the House of Commons earlier this month, as part of his duties as the West Cornwall Youth Parliament President. Over 250 members of youth parliament entered the House of Commons chamber to debate five issues voted for by 1.1 million youths across Britain. Topics debated in the chamber were homelessness, lowering the voting age to 16, knife crime, mental health and introducing an equal minimum wage regardless of age. In the final debate of the day Will addressed the house on the importance of tackling the knife crime epidemic saying 'any issue that affects the health and wellbeing of the young people of Great Britain deserves to be [the Youth Parliaments] campaign' and that members of youth parliament should take it upon themselves to back the motion and 'help make society safer for [their] constituents'. Will received a standing ovation from those in the room, including the leader of the Labour Party Jeremy Corbyn, who happened to be in the chamber at the time. Will's speech featured not only in a stream by Parliament TV on Friday, but also in the parliamentary highlights the following day on BBC Parliament. Once all five motions had been debated, MYPs cast their vote for which topic they think the Youth Parliament should focus their campaign and efforts on for 2019, with knife crime and votes at 16 coming out on top.